One of the few things that all of the authors, analysts, professors and pundits agree on is that there is something going on loosely called the Information Revolution, and that we are living in the relatively early stages of something called the Information Age. Where they differ drastically is in their theories of when exactly it started, how exactly it manifests itself, and most importantly, where will it lead us. Over recent years, the dialog has begun to congeal, as if many different thinkers are coming to the same conclusions in their respective domains, but using different words to describe their findings. Patterns and paralells seem to intuitively arise across disciplines that previously seemed incongruent. Businesses start to look like ecosystems, computers start to look like organisms, and every morning we wake up wearing more and more of McLuhan’s electric skin. The goal of this blog is to explore these parellels in an attempt to elaborate on the Connective Hypothesis. The posts aim to interpret leading theories and cite examples of collectives and connectives in different contexts. 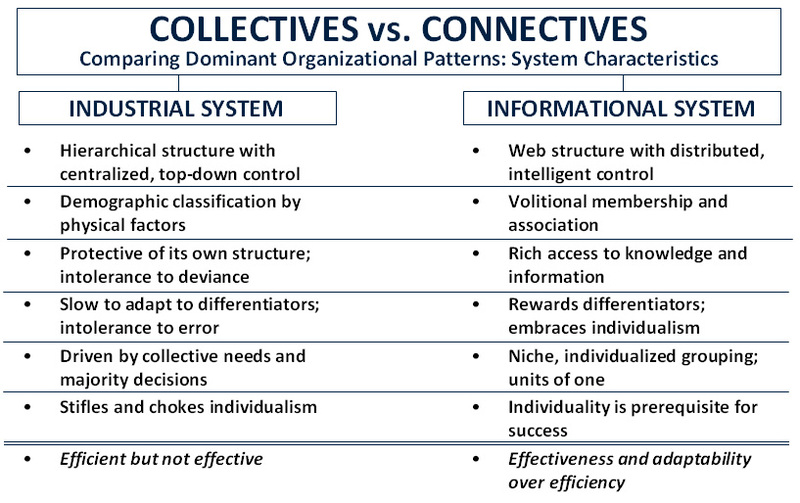 The following table captures the characteristics associated with industrial organizational systems (collectives) compared to informational systems (connectives), as identified in the original version of the hypothesis. The posts on the blog aim to reinforce the hypothesis by elaborating on the characteristics in the table below. Posts tagged with this icon elaborate on the characteristics of industrial organizational systems, or collectives. Posts tagged with this icon elaborate on the characteristics of informational organizational systems, or connectives. As our organizational perspective shifts from collectives to connectives, every role we play in our lives is being drastically altered, even how we see ourselves. Viewing the transition through the lens of the roles we play allows for domain-specific examples and theories to be drawn into a larger pattern. To that end, the hypothesis of the Connective is divided across five broad roles: consumer, producer, citizen, innovator and self. As well as being associated with either collective or connective characteristics, each post is tagged with a category corresponding to one of these roles, as in the graphic below. The sixth category, Defining the Connective, is for posts the build on the core definitions. Over the coming weeks, my aim is to add a specific page elaborating on each of these roles, in the context of the Connective Hypothesis. In the meantime, please watch or download the original presentation on the Connective to see how the concept is positioned within each role. Note that the hypothesis described on this site ultimately represents the development of an idea in progress. The content is intended to be more of an exploration than a final position, so please temper any feedback or criticism. I welcome any new and contrary positions — to not be so wouldn’t be very connective of me. I welcome any citation, and ask only that you include a reference back to the site so that others may join the conversation as well. Of course, I will do my best to credit the source of any material I reference. If the material collected here evolves to a respectable point, and there seems to be interest, I would love to explore formal publication.